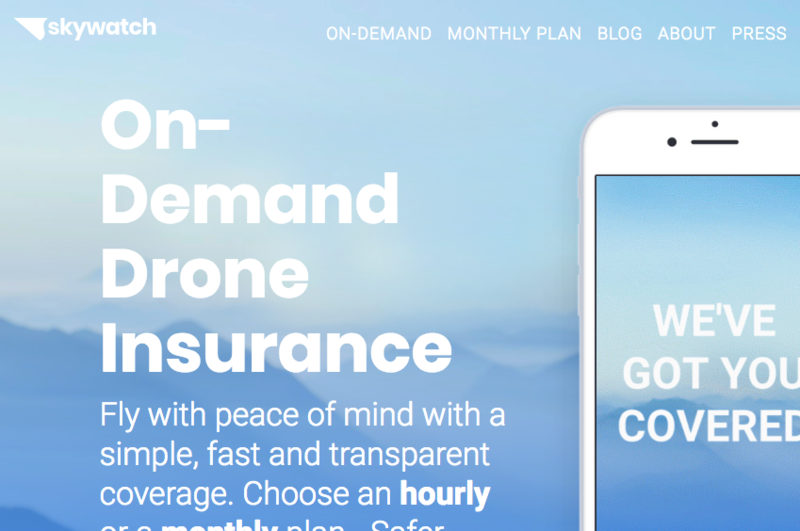 In this Drone Law Pro Radio interview with Tomer Kashi, the founder and CEO of SkyWatch Insurance Services, Inc. we explore the state of the art in on-demand drone insurance. Better Technology, Better Coverage. More flexible Drone Insurance Options. As the drone insurance market continues to evolve, better option are becoming available to Part 107 drone pilots and service providers. Higher limits, cheaper on-demand rates and more exhaustive coverage are a few of the ways in which on-demand drone insurance is evolving. SkyWatch is a leader in the demand insurance space. Learn why in this DLP Radio interview with Tomer Kashi. The history of SkyWatch technology and insurance offerings from Verizon Ventures funding to its backing by partnered with Starr Aviation, the largest aviation insurance company in America. The SkyWatch app advantage. When you need more than a million in coverage of fast, transparent hourly liability insurance fro Part 107 drone operations. How SkyWatch uses telemetry data from the drone itself to assess how risky the flight was and if you are a good or bad pilot. How SkyWatch rewards safer pilots over time with better premiums. Welcome to Drone Law Pro Radio. Visit DroneLaw.Pro where Part 107 pilots become Part 107 professionals. Here’s your host, drone attorney Enrico Schaefer [www.traverelegal.com, offices Detroit, MI, Austin, TX, Los Angeles, CA and Traverse City, MI]. Enrico Schaefer: Welcome to Drone Law Pro Radio. We are broadcasting from our Detroit office today and we have Tomer Kashi, the founder and CEO of a company that I find interesting, SkyWatch. They do on demand insurance for drone pilots and drone service providers and they do it in an interesting way. Obviously, it is the number one question drone pilots have is what are my insurance options? How do I get insurance? Customers want to hire drone pilots that have insurance. What I have always said through the years of representing software technology companies is, a big player will come into the space and do something innovative. Folks tend to think, ok well that has been done. We all know that Verifly really kind of set the mark in the insurance space by offering the Verifly app, which allows you to get on demand A la cart insurance for flights. Now comes SkyWatch which is offering a platform in an app which builds and does things that Verifly does not do. So, without further adieu, let’s go right into the interview. Tomer, how are you doing today and welcome to the show. Tomer Kashi: Enrico, thank you for having me. With this opening, I feel I may be unnecessary. That was a great grand opening. Enrico Schaefer: I always appreciate founders and CEO’s. You guys have the most scars and you are the ones that are the innovators in the space, and we love founders because it’s a special breed of person to come in and try to launch something as you have done. So, let’s just talk a little bit initially about SkyWatch. How the company was formed and what kind of financial backing do you guys have? If I am a drone pilot then I want to make sure that I am working with a company that has enough muscle to not only get me in the air safely, get me insurance but be around for a while. Tomer Kashi: Sounds good, yes. That stuff with SkyWatch as the company and then talk about SkyWatch as a drone insurance product. So, SkyWatch was founded three years ago. We are a BC backed Insurtech company, meaning the technology guys that are developing technology for the insurance world. We have raised so far 2 million dollars from early stage BC that specialized in insurance and Verizon ventures. We also were very fortunate to have civil senior insurance executives that joined as early investors. Also, SkyWatch is not only a tech company, we are also licensed insurance broker in 50 states. And we are partnered with Starr Aviation, the largest aviation insurance company in America in order to provide insurance for us, for the drone pilots in the industry. Enrico Schaefer: Yes. So you stand as the technology piece and the broker piece between the underwriter and the pilot and obviously making sure that not only is the app and the tech solid but also that the insurance underwriter is solid. And obviously you are working with the biggest and baddest underwriter on the block with terms of aviation. So, that should give drone pilots a level of comfort. How long have you been around, Tomer? Tomer Kashi: In the company? Tomer Kashi: We’ve been around since 2016, so we are offering a team of two years. At the moment we are seven employees, six in our Tel Aviv office and one in the U.S. So our R&D is in Tel Aviv. I personally wear many hats. I am not only the technology guy, but I am also the insurance guy and I am also Part 107 operator. Enrico Schafer: Yeah, which is really great because obviously you have to understand what is going on, on the ground to understand what is going on, on the ground. Tomer Kashi: Exactly. And thanks to the FAA for making it so easy to become one. Enrico Schaefer: Yes it is, it’s not that hard. Right? Let’s talk a little bit now about the product. You’ve got this app which does a couple different things. It provides safety feedback for pilots even if you’re not going to get insurance. And then of course you have the insurance aspect. So, explain to our listeners a little bit about how the SkyWatch app works and what the benefits are. Tomer Kashi: Great. So as we said, we have created an app that provides fast, transparent hourly liability insurance for the drone industry basically. And in a typical scenario a drone pilot can download our app either from the App Store or Google Play. You plan the area that you want to fly in, and he gets an immediate quote according to the hazards in the specific area. Weather it is a road that are in the area, no fly zones, public spaces and then the pilot just chooses the duration of his flight and the liability limit that he wants to have. We provide anything between half a million to ten million dollars of liability. These kinds of products could be very interesting for two kinds of pilots. One of the ones that needs insurance for a specific job and doesn’t have insurance. And the other type of pilots are guys that already have one or two million dollar liability under their yearly coverage, but then they need a specific insurance coverage for a specific contract. Let’s say for a construction company or a communication company, these usually ask for five to ten million dollars of liability insurance. They can just get it from the app instantly. Enrico Schaefer: Yes. That’s fascinating, and we are starting to see that more and more in the contracts that we do for drone service providers. Customers are becoming more sophisticated and for certain types of operations, they definitely want more than a million in coverage. Tomer Kashi: Yes, I definitely agree. In addition to that, something that is unique and interesting in our platform is that we can optionally get the telemetry data from the drone itself to assess how risky the flight was. And then we can basically know if you are a good or bad pilot. And then we can reward safer pilots over time with better premiums. Enrico Schaefer: So that’s really fascinating to me Tomer, because being that a software guy and representing software companies, big data obviously has been the watchword for many years now. Well it turns out that big data in many ways has turned out to be too big. Building functionality on that data is the trick and providing value to the app user is the trick. So, you’re actually using this big data to provide this value to the user of being a safe drone pilot, safe flight discounts, and these types of things. What kinds of algorithmic stuff is going on with that flight data that allows you to adjust the risk and potentially lower the premium? Tomer Kashi: We are taking more than 40 cents, for specifically in DJI drones. But just in order to give you some examples, we are looking into the GPS, battery, communication with the drone. If you are flying very fast, very high, very far from the operator. Something that we found out for example is if you are flying very low, the flight is actually more risky because you have more chances to crash into a tree or another ground obstacle. So, it’s safer to fly high then to fly low. Enrico Schaefer: That’s fascinating. The piece of data that you get that is the real gold here is that you understand where there is an incident, you understand when there is a claim and so where as the single drone operator can go out and have the sense of what a safe flight looks like. At the end of the day, your company is going to have a better profile of what safe flight really means because you can accumulate this data and really understand where the risks in really life are, real life drone operators operating Part 107 commercial operations. Where are you in that process of having that kind of data and having that kind of insight into safe drone operations? Tomer Kashi: Yes. As we mention, this is one of the key advantages and one the pieces of digital advantages over time in our company in the fact that we are having and will have more and more data over time. This will definitely put us in a position that we can have price the risk much better then basically anyone else. We already published very interesting insights on our blog with regards to flight safety. But it’s only the beginning. The industry is only beginning today. These are men piloting and human operation flights, in the future semi-autonomous and full autonomous. The most important thing is to keep up with the pace of the industry and to have it evolving over time. Enrico Schaefer: Yeah. So that’s the key right, is like the data is just starting to come in. Tomer Kashi: Exactly. And not less important, another key issue is to bring the value of the data to the end customer. Because what’s important for the end customer, for the pilot, is not how cool the system is, how simple, how fast, how reliable the coverage is, and people just want to get their job done. Enrico Schaefer: Let’s talk a little bit about the pricing of SkyWatch. And I’m looking right now at your SkyWatch.ai website. So Skywatch.ai is the domain name and, of course, you mentioned the blog. I immediately went and checked that out. This is interesting stuff. I would definitely recommend to the drone pilots that you want to be following this particular blog because you are going to really get some insights into this concept that I find so fascinating, which is safe flight. And so, everyone should go there. Let’s take a different tact on this Tomer. What is the pricing for the use of your app as compared to for instance a Verifly? How do you do pricing? How are you different then Verifly at SkyWatch? Tomer Kashi: Yes. Let’s start with the basics. The app if for free. Everyone can download it, everyone can fly with our app, use it for risk assessment. We don’t charge anything for it. We charge only if you want to buy insurance with our app. Now our pricing in comparison to Verifly is quite similar to begin with. But then over time the two factors that are taken into account. One is your insurance experience with SkyWatch that can get you up to a 25% discount on the base price. And the other is your safety score that is based on either the telemetry data that we have from your flight if you are flying with our optional digital flight module. Or from telemetry data that you send us or sync with us. For example, from platforms such as DroneDeploy. So, if we have your flight data, we can analyze these flights and then give you another discount of up to 25-30% more. Then overall your rates could be up to 50% lower. So, for a flight that you would pay at $10 per hour for, you would pay with SkyWatch only $5 per hour for. Enrico Schaefer: Wow! So that is really fascinating. This fly safe, this safe flight concept is really the key. So, it sounds to me, if I’m a drone pilot and I’m not necessarily needing insurance for a particular flight, I should still be using the SkyWatch app. I should still be getting that safe flight information from SkyWatch and building my safety record with SkyWatch so that I can reduce my premiums. Is that kind of the way it works? Tomer Kashi: Yes, definitely. You can build your safety record with SkyWatch regardless if you are an insurance user or not. You can use it for future insurance discounts but not only for that, if you want to show someone how safe you are, it could be a certificate of safe worthiness. Tomer Kashi: This is another thing that we provide the community for free and we are very happy that people are using it. Enrico Schafer: I take it that you provide the necessary information so that pilots can understand what a safe flight is and what kind of record they should be building? Tomer Kashi: Exactly. We have a summary screen inside the app where the safety insights are. What you can do better for the next time. I must say that these are things that are built and improving over time. So, there is something very interesting right now in the app and things that are improving quite quickly. Tomer Kashi: Ok. It’s a great question because if we are already having one product, why have another one? So basically, the things we together talked about, one differentiator which is the price, but we aren’t only cheaper, I think that our product as is, is more also comprehensive. We provide not only hourly insurance options, but also monthly base insurance. So, from the app you can get monthly coverage, and then it doesn’t really matter how much you fly. While you are flying you can get monthly coverage up to ten million dollar liability. We can also provide insurance not only third party, but for also the physical damage of the drone. And then it’s up to you as a drone pilot, if you are having a strong month then go for the monthly. If business is running a little bit slower, then go for the hourly. You can also do a monthly subscription for one million dollars and then buy the higher limits of five and ten million with the on demand. We see a lot of customers that are doing that. So, you have all the options in your hands and its just for you to choose. Enrico Schaefer: That’s amazing. And so, it really does get back to what I always say is that the first person in the market is great, that’s great innovation. But the real innovation comes as additional players come into the market and start pushing on what’s already there. Congratulations to SkyWatch, you guys are clearly doing that in probably the most important piece of the puzzle for most drone pilots which is the insurance piece. Tomer, it has been a pleasure speaking with you today. Thank you so much for being on the show and we look forward to speaking with you again sometime. Tomer Kashi: Ok, thank you very much Enrico. Thank you for having me. You’ve been listening to Drone Law Pro Radio. Visit us at DroneLaw.Pro. Don’t forget to subscribe to this podcast, you can find us on most podcast listening platforms including your home devices by searching Drone Law Pro. Don’t forget to share this podcast on your social media and with your Part 107 friends. Until next time, fly safe.